Monday, Aug. 30, 5:30 PM Update: Today's preliminary high of 96° brings the August average to an even 80.0°. If Tuesday averages at least 78° (for example, 88°/68°), the month will end up at 80.0°. An average of 81.5° (95°/68°), as forecast, would bring it up to 80.1°. That would tie the 9th hottest August. Monday, Aug. 30, 4 PM Update: Temperature has been 95° for 2 consecutive hours. Monday, Aug. 30, 2 PM Update: As of 2 pm, the high is 95°. Monday, Aug. 30, 1 PM Update: The temperature hit 92° by noon and has risen another 2° in the last hour, so the forecast high of 96° is well within range. This is now the 56th day with 90° or higher temperatures. The morning low of 73° was 2° above the forecast. Saturday, Aug. 28 Update If the forecast temperatures are met or exceeded for the next 3 days, the old record hottest summer will be beaten by an amount equal to the range of the previous 13 hottest summers. 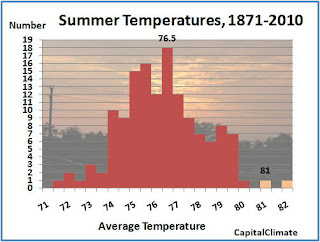 Today's high temperature at Washington of 83° as of 5 pm is 2° below the 30-year climatological average, but the summer average to date of 81.2° is still well above the old record hottest summer. Even if temperatures were to remain average for the next 4 days, the seasonal average would still come out to 81.0°, a full degree above the 1980 record. On the other hand, the forecast indicates that the lower 90s will return as early as Sunday, with mid to upper 90s likely before the month and season end on Tuesday. 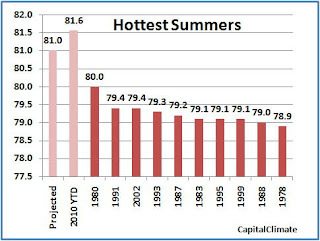 Plugging in the forecast temperatures, the summer average will finish right where it is now. This would be a greater margin than the difference between the current hottest and 10th hottest summers. 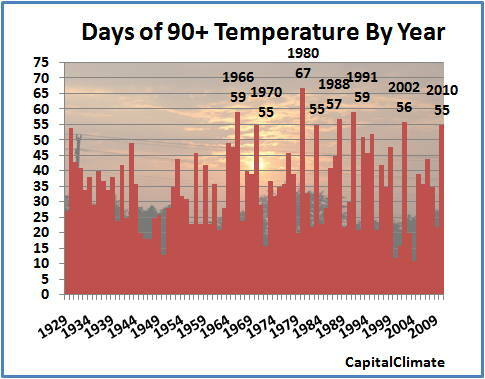 The expected 3 days of 90°+ temperatures, plus an additional 2 days extending into the beginning of September, would bring the yearly total to 59, tying the second highest annual number of 90°+ days. Not only will this summer be the first season ever to average above 80°, but it will be the first time that the average daily high has been above 90°, eclipsing the 89.4° in 2002. If August averages 80° or higher (It's likely to be 79.9° after today. ), this will also be the first time 3 consecutive months have averaged at least 80°. Stay tuned as we count down to the record through Tuesday. There are still a few more days to summer, but preliminary winter outlooks are already being issued. Bloomberg reports that Rockville, MD based MDA Federal is forecasting a relatively warm winter for the U.S., the warmest in 5 years. The prediction for 2,515 heating degree days in the U.S. is slightly less than the 10-year average of 2,577 and considerably below the 2,767 last winter. The temperature forecast calls for temperatures in New York to be 2.5° above the 30-year average and in Chicago 2° above. The latest 3-month outlook for December through February from NOAA's Climate Prediction Center also shows near to above normal temperatures for most of the country. Expectations of lower demand for the winter have done little to support natural gas prices, which have dropped 31% so far this year. See Washington DC Weather Records for the latest update. "total number of 90 degree days in washington, dc since 1950"
After reading about the estimated $30 million that the U.S. attorney's office spent on the Rod Blagojevich trial ["A Blagojevich defense, funded by taxpayers like you?," front page, Aug. 21], I'd like an investigation into how many taxpayer dollars Virginia Attorney General Ken Cuccinelli II is spending on "a team of lawyers" to investigate a University of Virginia professor's climate change research paper ["Judge to rule on Cuccinelli probe of climate study," Metro, Aug. 21]. It's absurd that in a time of enormous budget challenges, Mr. Cuccinelli has nothing better to do than spend millions of taxpayer dollars investigating the scientific findings of our state's premier academic institution. Not to mention the millions of tax dollars the University of Virginia will probably spend defending itself in this monkey trial. If Mr. Cuccinelli has run out of actual criminals to prosecute, it's time to look at his office for spending cuts. How about it, WaPo? Isn't it time for a FOIA request? The Climate Capitalist is proud to disclose that, except for 60 days of NOAA Commissioned Corps training at Norfolk, he is not now, never has been, and never intends to be, a citizen of the Capital of the Confederacy and is therefore ineligible to file, but "representatives of the media" are certainly permitted to do so. With a little over a week left in August, U.S. daily maximum temperature records are outpacing minimum records by the torrid pace of 7:1. 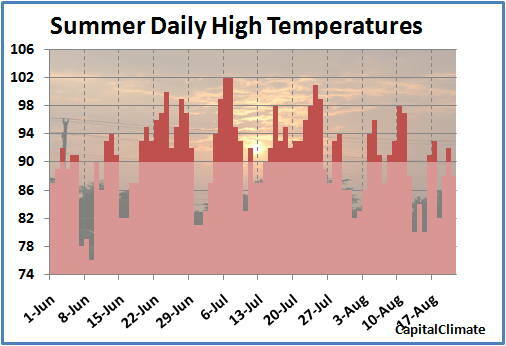 NOAA's National Climatic Data Center reports that through Sunday, August 22, a total of 845 daily high temperature records have been set in the 50 states, more than in all of July. Meanwhile, the number of low temperature records is only 121, less than half of the July total. The ratio of heat records to cold records is almost exactly 7:1 for the month so far. Following a January and February in which cold records exceeded heat records, this is now the 6th consecutive month in which heat records have predominated. In 5 of those, the heat records have been at least double the cold records; the ratio for the year to date has now risen to 2.25. 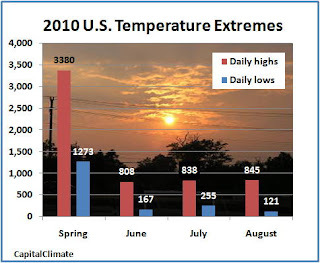 Image (click to enlarge): Total number of daily high and low temperature records set in the U.S. for spring 2010 (March-April-May) and June, July, and August to date 2010, data from NOAA National Climatic Data Center, background image © Kevin Ambrose. Includes historical daily observations archived in NCDC's Cooperative Summary of the Day data set and preliminary reports from Cooperative Observers and First Order National Weather Service stations. All stations have a Period of Record of at least 30 years. 8 PM Update: The high temperature reached 89° around the 6:00 hour. Today's preliminary high of 88° and low of 77° average out to 6° above the long-term normal. As the final week of August (and meteorological summer) approaches, Washington temperatures have continued above average overall. There were 2 more 90°+ temperatures in the past week (91° on the 16th and 92° on the 20th). 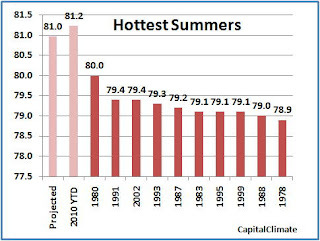 This brings the total for the summer to 49 and for 2010 as a whole to 54. This is within 2 of the 56 in 2002, although still well below the record of 67 90°+ days in 1980. 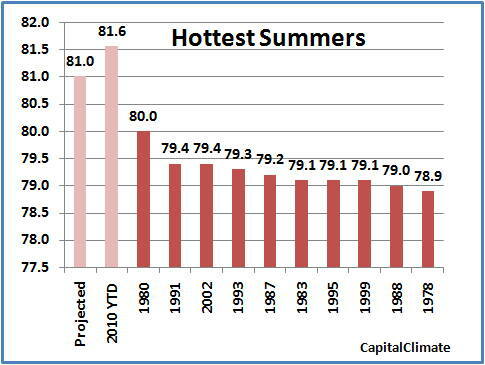 The summer average temperature of 81.6° continues well above the all-time record hottest summer of 80.0° in 1980. 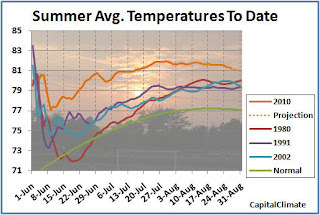 If temperatures for the remaining 9 days of August merely equal the long-term average, the final summer average will be 81.0° (up from 80.8° last week). This is a full 1° above the old record, a margin equivalent to the difference between the current record and the 9th hottest summer. 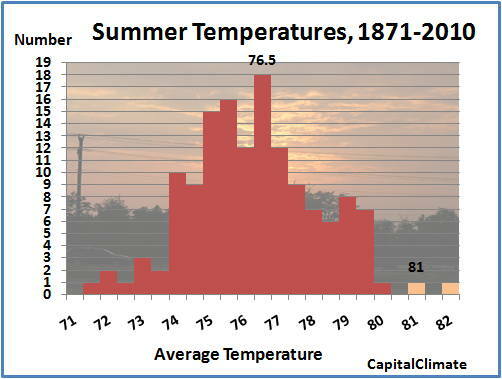 The histogram of summer temperatures shows how far this year deviates from the past 140 years of records. Each bar shows the number of summers with average temperatures within 0.5° intervals. 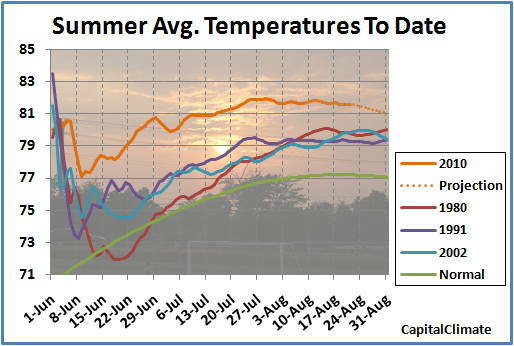 The 2 light orange boxes on the far right of the chart show the current season average to date and the projected result based on average conditions for the rest of August. The August average of 80.9° is unchanged from last week's value. Although not a record, if it were to hold, it would be the 6th warmest August on record. So far this season, the only days failing to reach 80° or higher were the 7th, 8th, and 9th of June, so today is now the 74th consecutive day of 80°+ temperatures. The latest forecast indicates that this string could break on Tuesday with a high of 76°. Although the current record summer of 1980 finished with a strong run of mid and upper 90s, it had already seen 2 days in August below 80° by this date.